Skyboxes are backgrounds that create the illusion of space and distance. 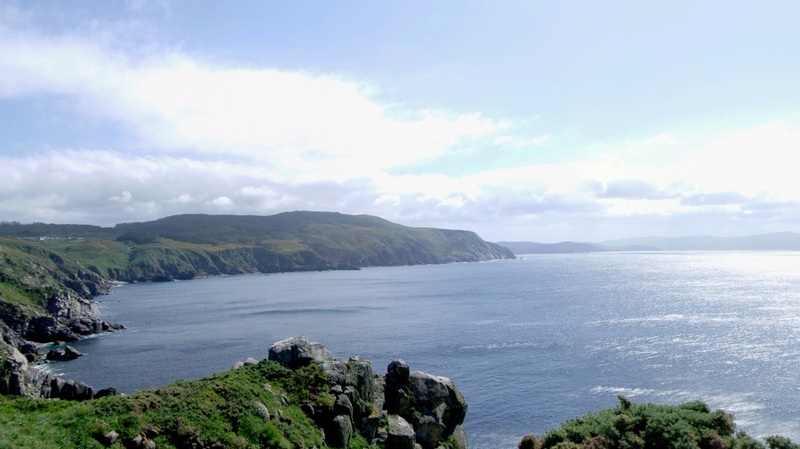 Typical skybox backgrounds include skies, clouds, mountains, and other scenery. As skyboxes are prerendered, they require little GPU and CPU. You can use cubemaps or 360° panoramic textures as skyboxes. You can also use them to light the scene. Currently, Xenko doesn't support skydomes or local skyboxes. Alternatively, you can display a 2D background, which is often useful for 2D games. A cubemap is a six-sided texture. When these textures are assembled in a cube around the scene, the cubemap simulates spacious 3D surroundings. You can capture a cubemap from a position in your scene. 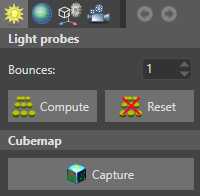 In the scene editor, position the camera at the point where you want to capture the cubemap. The direction the camera faces doesn't matter, only the position. Typically, you should capture cubemaps at the center of your scene to create the best all-round view. 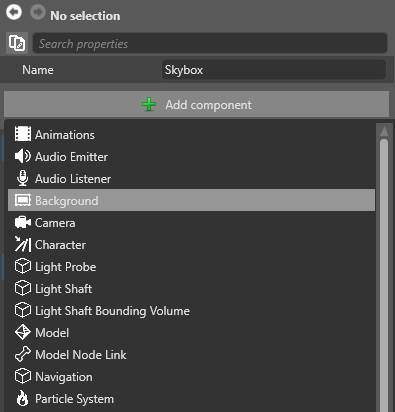 In the scene editor toolbar, open the Lighting options menu. Browse to the location on disk you want to save the cubemap, specify a name, and click Save. We recommend you save the cubemap in your project Resources folder. For more information, see Organize your files in version control. Game Studio creates a cubemap .dds file in the location you specified. 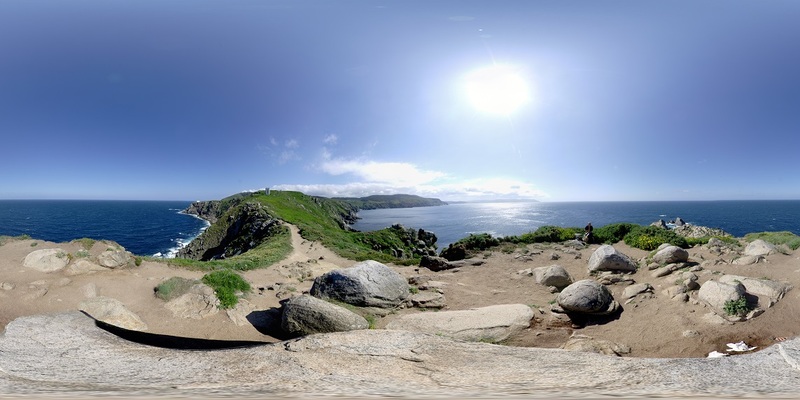 Instead of using a cubemap, you can use a 360° panoramic texture as a 3D background. Remember that post effects affect the appearance of your skybox. If it doesn't look how you expect, try changing your post effect settings. You add these like other color textures. 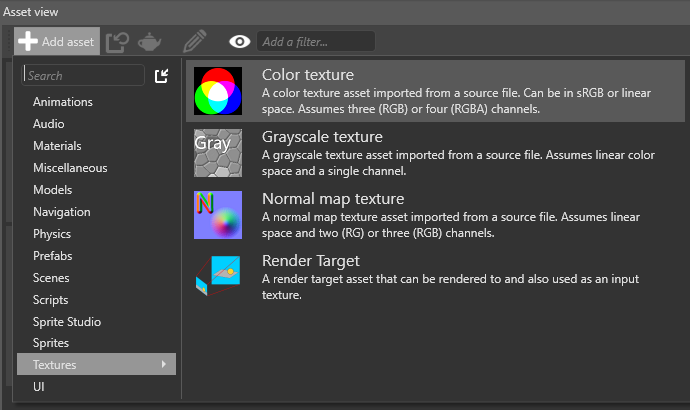 In the Asset View, click , select Textures > Color texture, and browse to the file. Alternatively, drag and drop the file from Windows Explorer to the Asset View, then select Color texture. 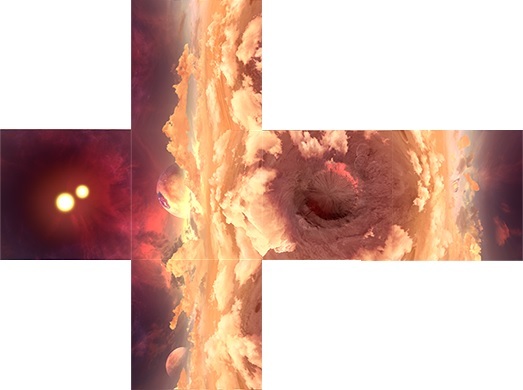 To create a skybox, add a cubemap or 360° panoramic texture to a background component. Xenko includes an entity with a background component in the project by default. Only one background can be active in a scene at a time. If there are multiple backgrounds, Xenko only loads the first. You can add background components to as many entities as you need. You might want to include more than one background, for example, if you want to switch skyboxes at runtime. In the Scene view, select the entity you want to add the component to. This can be an empty entity. Its position in the scene doesn't matter. In the Property Grid (on the right by default), click Add component and select Background. Under Texture, select the cubemap or 360° panoramic texture you want to use in the skybox. You can use a skybox to light the scene. Xenko analyzes the skybox texture and generates lighting using image-based lighting (Wikipedia). For more information, see Skybox lights. Instead of using a 3D skybox, you can display the texture as a static background. This displays the texture as a flat image that stays static no matter how you move the camera. This is often useful for 2D games. To do this, in the Background component properties, select 2D background. If you enable this with a cubemap, Xenko uses the first face of the cubemap as the background. For details, see Videos - Use a video as a skybox.